Hello! Today I have several seasonal cards to share using the Happy Mail stamp set from Pretty Pink Posh. 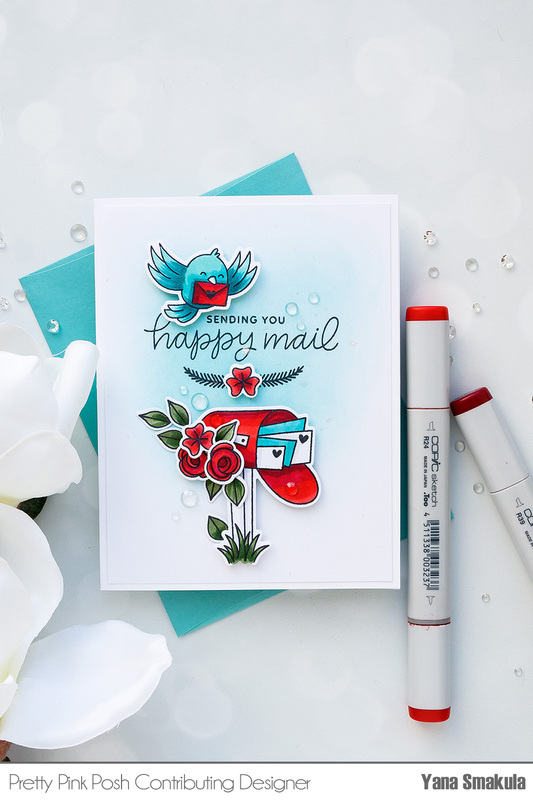 This is a smaller set that features an adorable mail box, a little bird carrying a letter, one additional letter image and two sentiment – Sending You Happy Mail and You’ve Got Mail. There are also coordinating dies available that will cut all of the images in this set out. It’s a fun and playful set that can be used to create everyday cards. This set has also impressed me as an all year round set as I feel it works well for every season and can be adapted to just about any holiday. 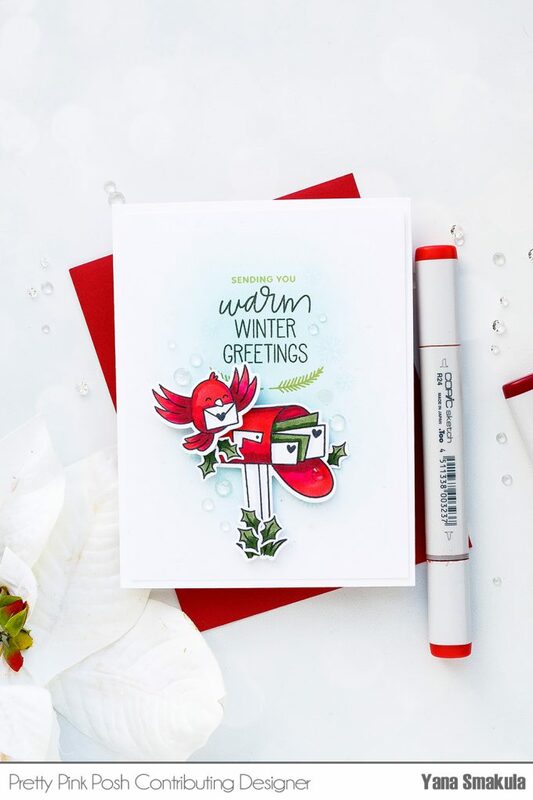 In this video I’ll show you how I used it along with other set from Pretty Pink Posh to create 4 cards for different seasons. I cut all of my stamped images out in my Platinum die cutting machine and used to create 4 cards. See details for each below. I blended Maliblue ink from Simon Says Stamp to create a background and added splatter using Hero Arts White Iridescent Shimmer ink. Stamped “Sending You Happy Mail Sentiment” in black ink along with two branches from the Holiday Greetings set. I foam mounted the mailbox and bird, embellished card using flowers and leaves from the Bold Blooms stamp set. Dressed the card up with the help of Sparkling Clear Jewels. I blended Orange Slush ink from Simon Says Stamp to create a background and added splatter using Hero Arts White Iridescent Shimmer ink. Stamped “Sending You Happy Mail Sentiment” in black ink along with two branches from the Holiday Greetings set. Foam mounted the mailbox. I stamped, colored and cut out additional images – mushrooms from the Woodland Critters set, leaves from the Autumn Blooms set and used them to set a Fall scene. Dressed the card up with the help of Sparkling Clear Jewels. Again, I blended the same Maliblue ink from Simon Says Stamp to create a background and added splatter using Hero Arts White Iridescent Shimmer ink. Stamped “Sending You Warm Winter Greetings”, I made sure to use sentiment that had a word “SENDING” in it as I think it associates well with the mailbox and letters. I also used holly leaves instead of flowers and mushrooms I colored my bird as a Robin bird and colored some of the letters green to to with the Red, White and Green color combo. All of the additional images I used here came from the Holiday Greetings stamp set. Dressed the card up with the help of Sparkling Clear Jewels. And last but not least I have a card for Valentine’s Day! Here I once again used lots of flowers, but I also added two little cupids above the mailbox. They are shooting their arrows and sprinkling lots of hearts around. These images came from the Cupid Friends stamp set. 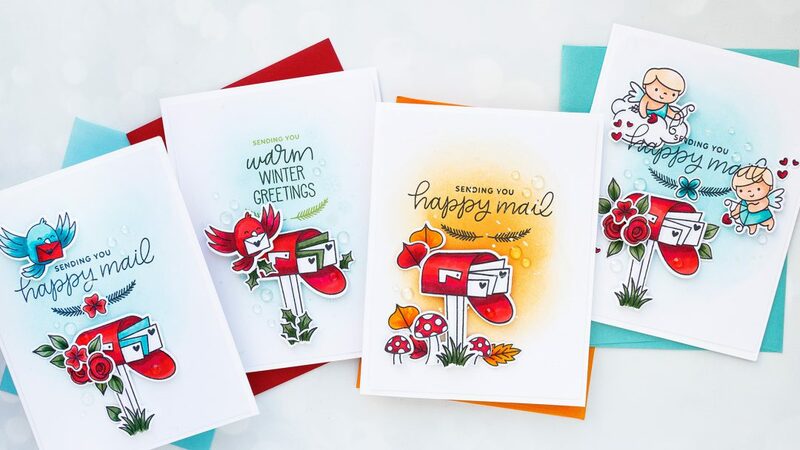 The Happy Mail stamp set can be easily incorporated into other seasons and occasions. If you swap flowers for easter eggs and add an easter bunny you can use it for an Easter card, Add more flowers and a Mother’s Day sentiment and you’ve got a card for mom and so on. Such cute cards!! I like lots of colors with red — light yellow, lt. blue (love the teal idea! ), lt. browns, violets. Red is such a dominant color and difficult to work with; and I love it; and I need to be mindful of other colors with it. Gosh! One could do a whole video tutorial just on working with red!!!!! 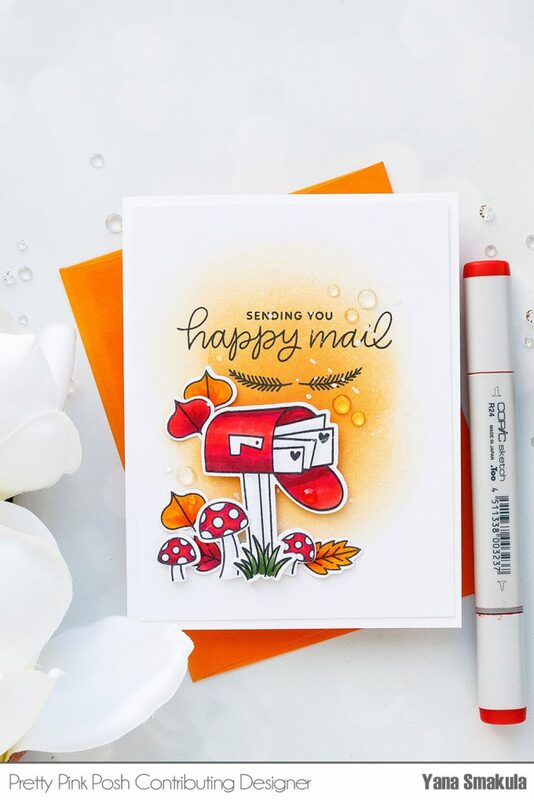 Thanks for showing the versatility of the stamp set and have a happy day!!! These are all fantastic Yana. The seasonal cards using the same sets are great. I wish I knew some colour combos to share but I am still learning from folks like YOU! Fantastic Yana! These look awesome. Fabulous cards, Yana! Love that cute little bird & your awesome coloring. These cards make me happy just looking at them! Your cards are adorable Yana, I love them all! I love how you have mixed images from different Pretty Posh Pink sets, it’s good to know they are sized to coordinate with each other. What fabulous work. I love each and every card. Your cards are always so nice, but these just might be my favourite. Love the colours and how well they pop. Your cards are amazing! I need to dust off my copic markers and practice my color. These cards are lovely Yana! I just love this little set with matching dies! I think all companies need 2/3 of these smaller sets in each release as it allows those with a tighter budget to still purchase something without feeĺing guilty. You did an amazing job showcasing this set and I love that you used the one stamp set for 4 different seasons with a few extra sets from your stash. I would see more of this – 1stamp set 4 ways/seasons/styles. !